School Savings for that Rainy Day. When Mort Hansen shared this photo (below) and some memories last year of the old school bank days, he created quite a deal of discussion on the ARW Facebook page. Photo courtesy of Mort Hanson. Many posters remembered their particular ‘bank’ day at school and how we would take our bank books and 6d or 1/- to deposit on the day. Many posters remembered their particular ‘bank’ day at school and how we would take our bank books and 6d or 1/- to deposit on the day. 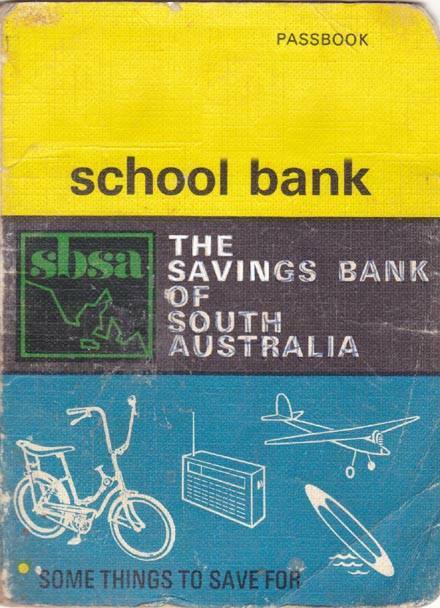 Many wrote with memories of the cover of their Savings Bank of South Australia Bank Book being a dark grey in colour, with pages inside having figures written in the columns and little stamped entries. Ruth Ridgewell wrote; “Yes, had one of these with a material cover with a pocket, so the 20c could be inserted to prevent losing it. It was really good seeing the hand-written balance increase every week”. And Susan Bennett remembered; “Mum made a special cover for ours, mine was blue with red flowers and a little pocket on the front to put my bank money in. We thought we were so special. I still have an account at Bank SA”. Philip Jeff worked for SBSA and recalled doing school bank 4 days a week from the Blackwood branch; “The money and books were collected by the teacher in an old chalk box and sent to us in an empty classroom. Every box was 20c short, every time. We carried spare cash to balance the difference”. Still others reminisced of about pocket money and how it was something that had to be earned and never given freely. I was reminded of how tough it was to get pocket money out of my parents, when my wife reminded me that one of her pocket money jobs was to regularly wash and clean the hairbrushes at home. I remembered my job of a Sunday morning after church was to rake up the dog’s poo and push the hand mower over the front lawn. My sisters had to help prepare the Sunday roast and also help mum bake biscuits and a cake while the wood stove was fired up (later the electric stove). Most parents in the 50s and 60s were very frugal and after all the household bills were paid from the single income pay packet, I imagine there would not have been a lot left. As boys we seemed to have more freedom than the girls, which allowed us to scout around most weekends looking for soft drink bottles, which we’d take back to the corner shop for the deposit, press button B in all the public phone boxes, or even try to catch some fish for which mum might give a shilling or two. I know that some kids today still have to do chores to get their pocket money but for us it was never guaranteed, you did the chores and hoped you might get paid! What are your memories of banking at school and pocket money as you were growing up? 3 Responses to School Savings for that Rainy Day. In Grade 6 at Forbes Primary, I was a bank monitor – there were two of us and we collected the class bank money, added it up and made sure it was correct before taking it to the bank representative, who came to the school each Wednesday. I got us out of a lesson each week. Just to clarify the original money boxes the bank had were completely sealed except for the coin slot and required a can opener to access the money. Then they changed to the ones that had the removable base plate. Every branch had a key. You would take in the box and they would open it and close it back up and credit the money to your bank account. On the side of the box it asked for boxes not to be presented on Saturdays.